Coach Keith Wiatrak gathers his team together during a timeout of their game against the Red Devils where the Indians would narrowly escape 47-43. PC: Gina Albertini. 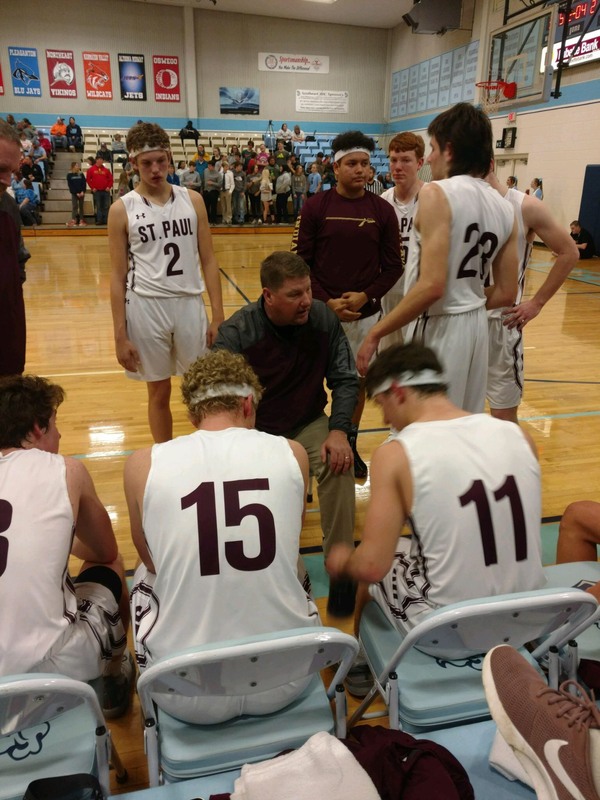 In their previous matchup, the St. Paul Indian boys (5-4) were defeated in a close matchup to the Southeast Lancers (5-5) 43-41. This then moved the Indians into the consolation bracket where they would square off against the Erie Red Devils (5-4), Jan. 17. It was an offensive outpour for Erie in the first as the Red Devils’ Gard scored 6 of their 13 points. St. Paul matched their effort in return putting up 10 points. At the end of the first quarter, the Indians trailed 13-10. The second quarter became more of a defensive battle as the Indians were able to hold Erie to 7 points total. St. Paul would open the gap at the half 22-20 with points totals shared all across the board as the Indians were passing the ball with perfection. Erie would experience a quarter of stale scoring as the Indians aggressive, pressuring defense allowed the Red Devils to only 3 points. St. Paul continued their consistent scoring with 10 points in the third as the Indians led 32-23 heading into the 4th. As the Indians maintained a comfortable lead heading into the final quarter, the Red Devils were on a mission to get back into the game. Turnovers and missed opportunities from the Indians helped Erie get the game to within two points. The Indians had trouble covering Erie’s Gard in the fourth as he was able to score 11 in the quarter alone. But with key free throws from junior Adam Albertini, the Indians were able to escape 47-43. There were multiple Indians’ players within double digits; Lemmons (10), Dent (11). Other key efforts to St. Paul’s win include; Haney (9), Albertini (9).